Santa Cruz Soccer Camp is not only a fun place where children learn and develop soccer skills, but also a place where youth learn how to coach youth. Thanks to our leadership development program, we are able to instill valuable life skills as well as develop coaching prowess amongst our 13-15 year old campers. Following two weeks of Leadership Development, graduates continue on to volunteer, intern, coach, and may even one day become a director at our camp. Roughly 95% of our current coaching staff attended as SCSC as campers, and are graduates of the Leadership Development Program! Leadership Development is a unique program that provides an opportunity for teenagers to build life skills, serve as mentors for younger campers, and experience a rewarding summer. 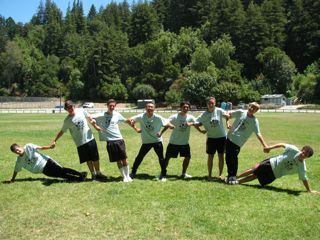 Each year, Santa Cruz Soccer Camp demonstrates its support for our local schools. We donate an average of $2500 worth of free-camp certificates to schools for their fundraising purposes. Our coaching staff is visible throughout the year, volunteering at school Carnivals or providing assistance for soccer related activities. Many members of our coaching staff are directly involved in local schools, working with after-school enrichment programs, tutoring, and coaching soccer teams. Our two Directors are even credentialed teachers! 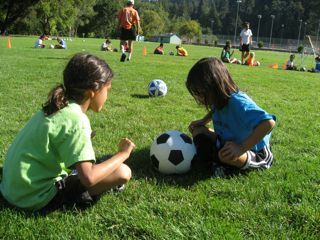 In recent years, Santa Cruz Soccer Camp has partnered with the Foster Parent Association to provide a special opportunity for children who may not have the chance to attend our camp due to personal or monetary reasons. To support families who cannot pay the full tuition for our camp, we have established a designated scholarship fund. If you are interested in applying for a scholarship, please contact Bill Trimpi at 831-246-1517. If you would like to donate to our scholarship fund to support families in need, please include a donation with your mail-in registration. Tell a friend about us. and you can like us on Facebook below.